Buy Thumbsticks a Coffee. ko-fi.com/thumbsticks - Ko-fi ❤️ Where creators get paid by fans, with a 'Buy Me a Coffee' button. The Thumbsticks team writes interesting articles about video games. br/br/Our focus is on nurturing new talent and offering opportunities to aspiring writers, and your support allows us to continue doing that in bigger, better ways. br/br/Every penny that we receive from Ko-Fi will be poured back into the site and our freelance budget, to allow us to support new writers and nurture developing talent. Thank you for visiting our Ko-Fi page. If you like what we do, then please consider supporting us! Every penny you pledge in support will go into running the site, and create opportunities for aspiring writers and new voices. Secured Payments. 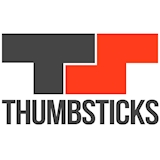 Support goes to Thumbsticks's account. Upgrade Thumbsticks to a yearly Gold Membership with a one-time payment.